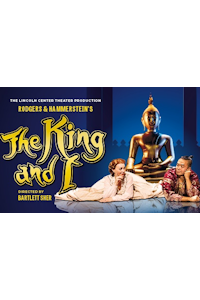 The King and I tickets at Alexandra Theatre, Birmingham. 2019-2020. Find the best The King and I musical tickets at Alexandra Theatre, Birmingham. The 1951 classic is based on a diary, entitled Anna and the King, which tells the story of young Westerner Anna Leonowens who is brought to the court of the king of Siam to become the tutor for his children. The musical, which was made into a film starring Deborah Kerr and Yul Brynner in 1956, features several classic songs including "Shall We Dance", "Getting to Know You", "Hello Young Lovers" and "I Whistle a Happy Tune". Approximate runtime 175minutes (including any interval). Performers Jose Llana (The King), Annalene Beechey (Anna), Cezarah Bonner (Lady Thiang), Kavin Panmeechao (Lun Tha), Kamm Kunaree (Tuptim), Kok-Hwa Lie (Kralahome), Aaron Teoh Guan Ti (Prince Chulalongkorn), Philip Bulcock (Captain Orton/Sir Edward Ramsay), William M Lee (Phra Alack), Yuki Abe (Ensemble), Miiya Alexandra (Ensemble), Aiko Kato (Ensemble), Misa Koide (Ensemble), Ela Lisondra (Ensemble), Yuki Ozeki (Ensemble), Ena Yamaguchi (Ensemble), Sian Yeo (Ensemble), Iroy Abesamis (Ensemble), Cletus Chan (Ensemble), Steven Hardcastle (Ensemble), Eu Jin Hwang (Ensemble), Jesse Milligan (Ensemble), Prem Rai (Ensemble), Joaquin Pedro Valdes (Ensemble), Rachel Jayne Picar (Swing), Nick Len (Swing), Jasmine Leung (Swing), Samuel How (Swing). Author Rodgers. Author Hammerstein. Presented by The Lincoln Center Theater. Director Bartlett Sher. Costume Catherine Zuber. Design Michael Yeargan. Lighting Donald Holder. Sound Scott Lehrer. Choreographer Christopher Gattelli. Musical Director Stephen Ridley. Tuesday, 10th December 2019 to Saturday, 4th January 2020. The King and I tickets: The tabs above allow you to select between links to suppliers and date searching. Click on a supplier's logo to see their details and on the 'buy now' button to see and check the tickets on offer.